Each Arlo Pro has 720p recording, 8x digital zoom, and infrared night vision. The battery (remember, these are wireless) lasts for six months on a charge, which is pretty impressive. Both cameras will have to be in range of the Arlo Hub inside. The free tier of Netgear's subscription plan offers seven days of online storage, and they can be saved locally through a USB drive. The cameras can be mounted either with their built-in feet or with the included wall mounts. 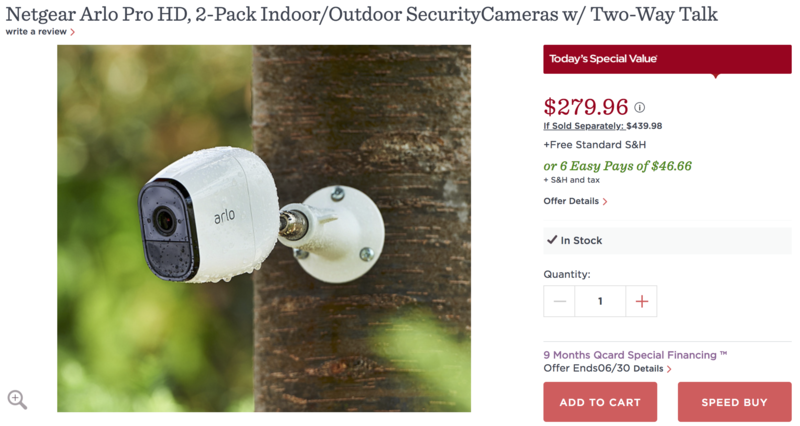 QVC is offering a two-pack for $279.96, which is the lowest price we've seen for these. For reference, Amazon offers a refurbished version for $298 and a new set (like what's offered here) for $420. Shipping is free. If you don't yet have any smart security cameras in your house, these are a great option.